In a stack with continuous deployment enabled, by looking at the list of Undeployed Commits it is not clear which of them are going to be grouped and deployed. 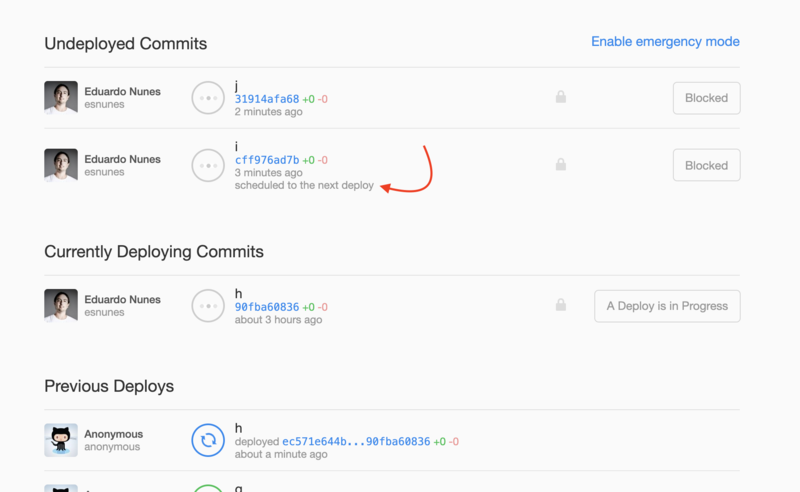 Based on the config value deploy.max_commits flag the commits that are supposed to be grouped and deployed. This PR was created on top of #890 . Implementation looks good to me besides a couple nitpicks on naming. As for the feature I honestly don't have much opinion on it. @@ -35,12 +35,30 @@ def deploy_disallowed? It's weird to extract the method content, to finally just alias it. I've extracted the method content to re-use it in the deploy_scheduled? predicate. In the context of deploy_scheduled?, the method name deploy_discouraged? does not express the conditions needed to validate the proposition. Not a huge fan of that naming. I'm not a good english speaker, but somehow maximum_commits_per_deploy_hit? or even maximum_commits_per_deploy_reached? would feel more natural to me. However I defer to native speakers. I agree with you, I wasn't happy with the naming too, thanks!